Backed ourselves with sound amenities and talented personnel, we have emerged as one of the leading organizations actively engaged in offering wide gamut of Soluble Cutting Oil. 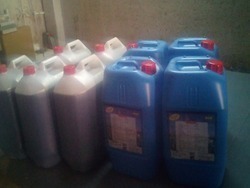 The offered oil is widely used in industry and is the least expensive among all cutting fluids. The offered oil is available in varied packaging options for delivery within the set time-frame. Clients can avail this oil from us at market leading prices. Application: All machine tools where cutting operation occurring. Very good cooling and lubricating properties. Coolant can work in all water viz. R.O, D.M and up to 400 ppm hard water. Excellent foam control materials used.